When a user shares an assessment with another user, it can be accessed from the Notification Center (bell icon) in the Top Menu Bar. From the Notification Center, the assessment and any supporting documents can be viewed, added to the Assessment Manager, or declined. 1. In the Top Menu Bar, the Notifications Center is located under the bell icon. Click on the bell to view any notifications. The number of notifications will be indicated in the upper right corner of the bell. 2. In the Notification Center, new or unread notifications will appear under the New Notifications tab, while notifications already viewed or declined will appear under the Past Notifications tab (2a). To view a new notification, click on the green circle with a plus sign to open it (2b). a. The shared assessment will show the date, the name of the assessment, the user who has shared it, the assessment name, subject, and type. b. 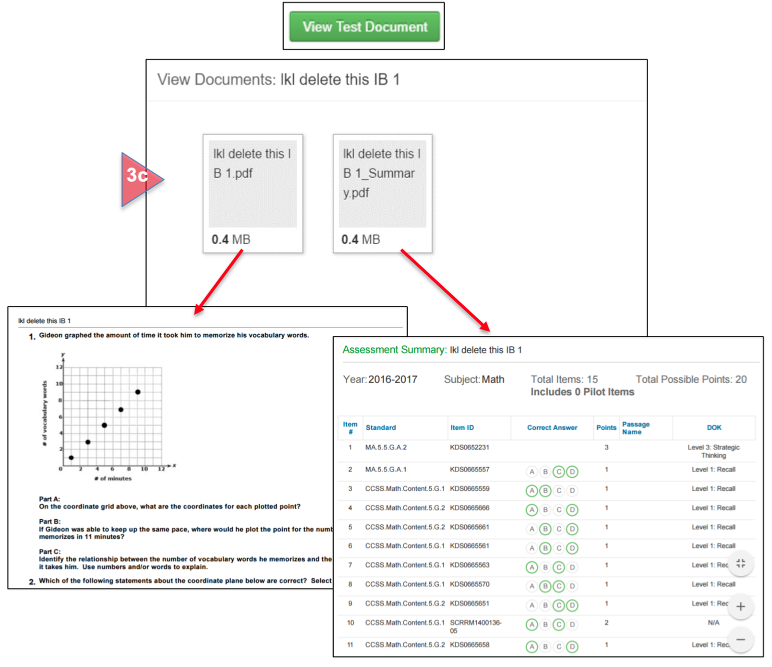 View the shared assessment, add it to the Assessment Manager, or decline it. c. View Test Document: Click here to preview the test booklet, and depending on the type of assessment, the summary document, which contains standards, student test with answers, rationales, rubrics, etc. d. Add to My Assessment: Click here to add the shared assessment to My Assessments. Rename the assessment with a unique name before adding it. Click Save. Then click OK when the confirmation message appears. e. Assessment Manager: The shared assessment will now reside in the Assessment Manager under My Assessments, and under Recent, as an unpublished assessment. f. Setup: Click on the gear icon to return to assessment setup, revise any part of the assessment, and publish it in the last step. g. Publish: The assessment may also be published by using the down arrow in Functions, and selecting Publish. 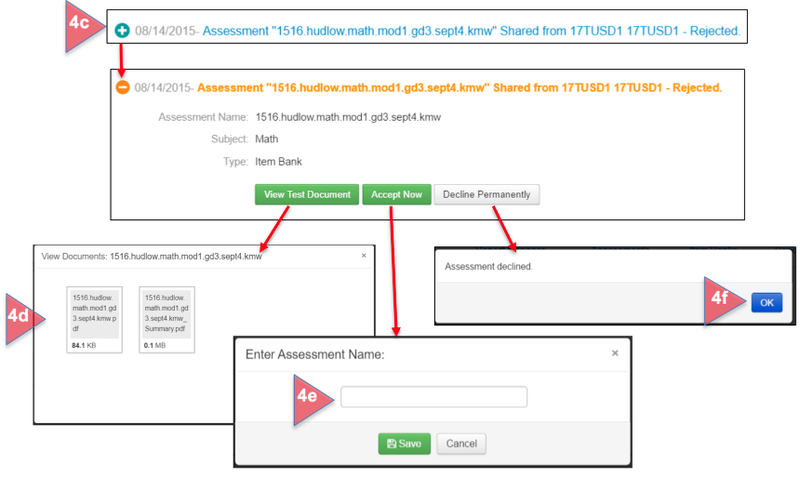 h. Decline an Assessment: If you do not want to add the shared assessment to the Assessment Manager, select Decline. Then click OK.
a. Use the search boxes to find a past notification. Click on Refresh after entering the dates or name. b. Each assessment you have Added (Accepted) or Declined (Rejected) will be listed with the action taken. c. View or accept a previously declined assessment by clicking on the green circle with the plus sign next to the assessment name. d. View the Test Document: Click here to view the Student Booklet and Summary Document if available. 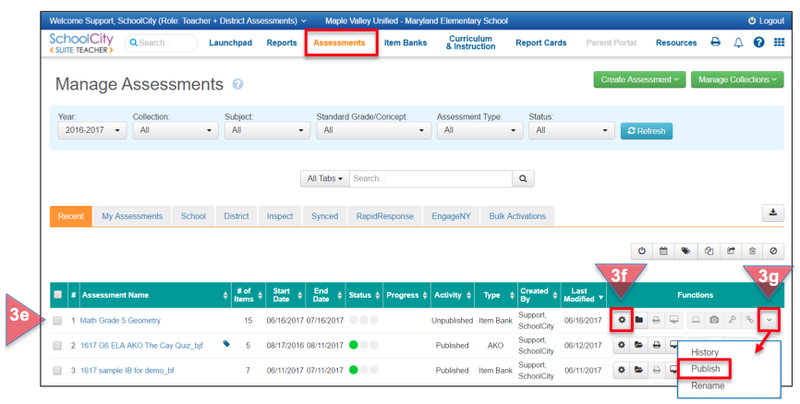 e. Accept Now: Click here to rename the assessment and add it to your list in the Assessment Manager. f. Decline Permanently: Click here to delete the assessment from your past notifications list, then click OK in the confirmation message.